"This is an easy but wonderful recipe, all my friends love It, and I sell it to Tea Rooms." Preheat oven to 350 degrees F (175 degrees C). Spray a 9 or 10 inch Bundt pan with non-stick cooking spray. Combine the cake mix with the frosting, eggs, oil, water and 1/2 of the pecan pieces. Mix until combined. 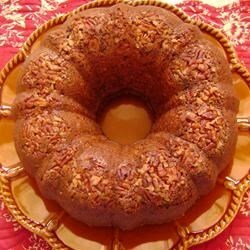 Sprinkle the remaining 1/2 of pecans in the prepared Bundt pan then pour in the cake batter. Bake at 350 degrees F (175 degrees C) for 50 minutes or until a toothpick comes out clean. Took it to a PTO Officer meeting and they loved it!! Betty Crocker makes the butter pecan cake mix. We collect the box tops and this helps our program!! Thanks for the great recipe!! Excellent cake recipe and EXTREMELY easy! I did decrease the oil to 1/2 cup after the first one and it's perfect!